Here is an article by Wouter Melissen of Ultimatecarpage.com, telling the story of Tipo 12C. With the arrival of the government backed German Grand Prix teams, Alfa Romeo's stronghold on motor racing started to weaken. In sportscar and Grand Prix form, Vittorio Jano's marvellous eight cylinder had dominated in the early 1930s resulting in four consecutive Le Mans wins for the 8C 2300 and many Grand Prix victories for the Tipo B P3. The Tipo B combined the supercharged straight eight with a revolutionary chassis and is considered by many as the first true single seater. There is no doubt that the managing skills of a young Enzo Ferrari and the driving talents of Tazio Nuvolari, 'The Flying Mantuan' contributed much to the success as well. Unstoppable in its introduction year 1932, the Tipo B was showing its age by 1935 and despite the gradual increase of displacement from 2.6 to 3.8 litres, it was rarely able to match the advanced German racers. Nuvolari did manage to take a very important victory in the 1935 German Grand Prix at the Nürburgring in front of a large number of Nazi officials. 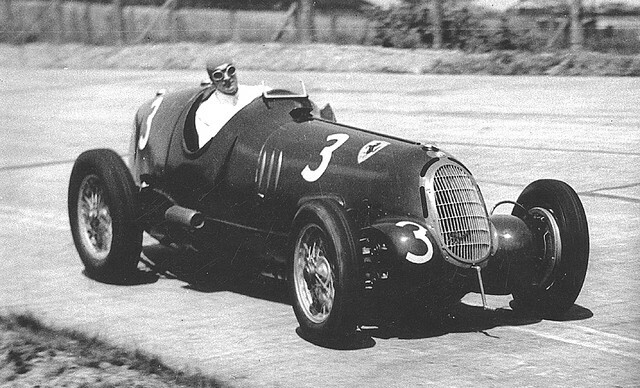 While the Alfa Romeo drivers struggled on in 1935, the factory was busy building a new chassis and engine. The biggest problem Alfa Romeo faced was the huge amounts of power the German eight, twelve and sixteen cylinder engines produced. At 3.8 litre the Jano's eight cylinder engine had grown to its maximum displacement, so work was started on an all new V12. In the mean time Ferrari attempted to bridge the gap with the hugely complex 'Bimotore', which as the name suggests sported two engines and was designed for high speed tracks like Avus. Remarkably the Bimotore (below) did manage to finish second, although most of the credits for that result have to go to driver Louis Chiron who was very careful with the tyres. He gained many positions as drivers ahead of him dropped out with blown tyres. The Tipo B Nuvolari drove to take that memorable win in Germany did not only sport the latest specification engine, but also a new independent front suspension through swing axles. Both were carried over to the new Tipo C chassis under construction in Jano's workshop. For the new car he went one step further and followed the German example set in 1934 by fitting independent suspension all-round. The package was literally rounded off with an curvaceous aerodynamic skin, which was quite a departure from the simple, square body panels fitted on the Tipo B. While originally dubbed the Tipo C, the cars are now commonly referred to as 8C 35 and the later twelve cylinder variant as 12C 36. The Italian Grand Prix at Monza in September 1935 saw the introduction of the new 8C 35, but Nuvolari was still not able to match the Germans for outright performance; there was still a gap of 100 bhp to bridge. 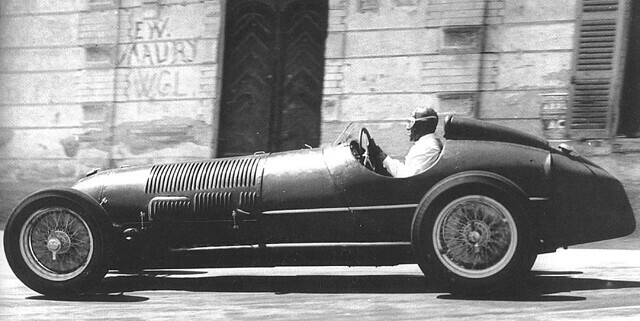 The introduction of the 4.1 litre 12C 36 at the Tripoli Grand Prix in May 1936 brought the deficit down to 60 bhp and brought Alfa Romeo somewhat in contention again. Although mostly in minor races, both the 8C and 12C models were driven to several wins in 1936, highlighted by victories in the Donnington Grand Prix and the Vanderbilt Cup in New York. In races with the German cars present a second place at Monza and a third at the Nürburgring, both with the V12 car, were the best results. With renewed confidence work was started on an evolution of the 12C for 1937. Subtle changes were made to the chassis to improve the handling, but most time was spent improving the engine's performance. The displacement was increased to 4.5 litres and with the help of newly developed twin-stage Superchargers the 12C 37 produced a hefty 430 bhp. Before 1937 was over both Jano and Ferrari had left the Milanese company and in 1938 Nuvolari also took off to join Auto Union. The big V12 engined 12C 37 was left obsolete after only a few months of racing because of drastic rule changes. Many of the 8C and 12C cars were disassembled and rebuilt to comply with the new three-litre regulations. After the War Clemar Bucci, an Argentinian gentleman racer, purchased a 12C 37 from the Works to race in the popular South American Formula Libre races. 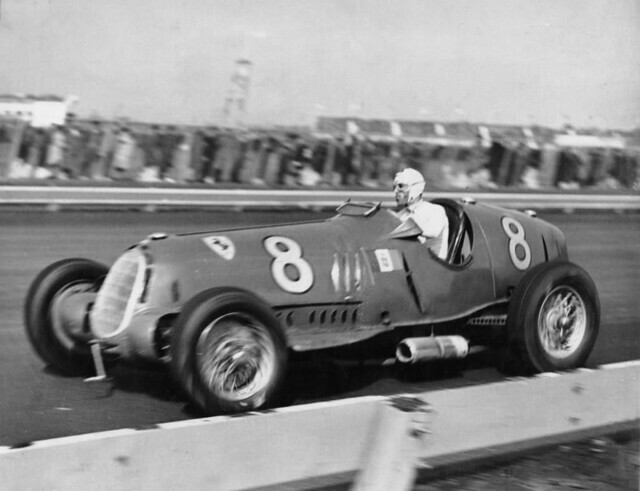 Surprisingly many Alfa Romeo racing cars had survived the War, carefully hidden away. The cars were brought back to running order and at least one of the Tipo C chassis was equipped again with its V12 engine, which was later sold to Bucci. In 1995 a V12 engined Alfa Romeo racer was retrieved from Argentina and completely restored by Symbolic Motors. A few years later a second car was also sourced from Bucci, which not surprisingly has led to a discussion whether both cars were built by the factory or whether one was built from spares in Argentina. There is evidence supporting both theories. The featured example is built to the 1937 twin-Supercharger specification, but features a later nose similar to those fitted on the post-War Alfettas. 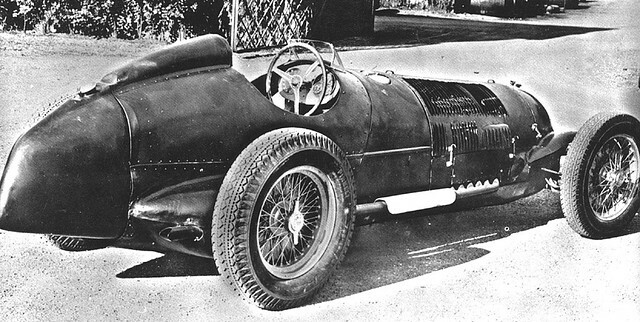 Before it was sold to Bucci, it was raced by Achille Varzi in the 1948 Buenos Aires Grand Prix. Wearing chassis and engine number 51204, the featured car is pictured at the 2006 Goodwood Revival and Monaco Historic Grand Prix. Yes, I know: it's Golden Arrow, land speed record car of Maj. Henry Segrave. Do you know what kind of car that gold one is behind the Ferrari? It's got amazing lines! Sardine cans, you say. Sad - but true.